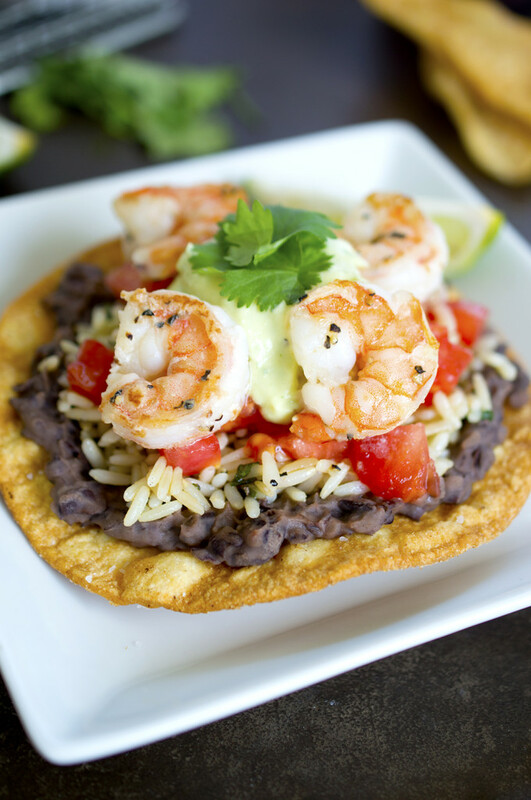 Fried corn tortillas layered with refried beans, rice, shrimp and a zesty avocado cream. Tostadas are one of my favorite meals. They are colorful and loaded with tons of flavor. Layer on your favorite toppings, salsa, sour cream, guacamole and you’ve got a delicious meal. 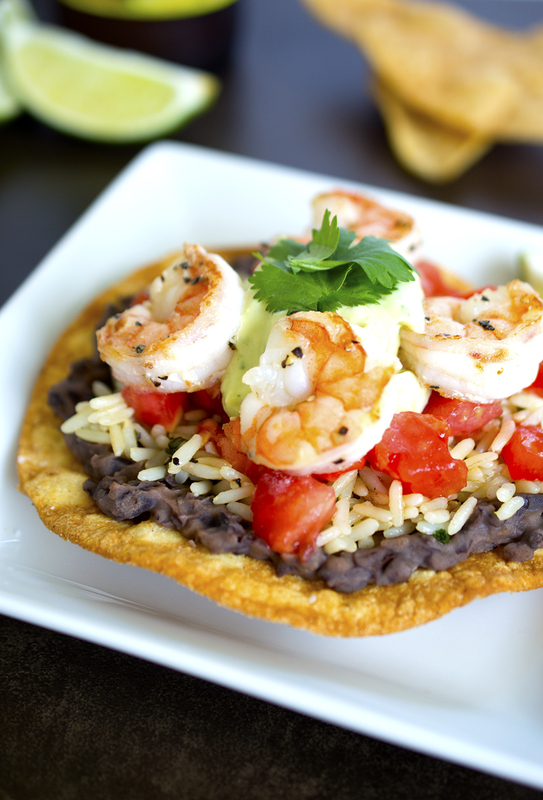 My Shrimp Tostadas are topped with homemade refried beans, cilantro–lime rice, tomatoes, shrimp and avocado cream. It’s like an inside out taco! I love being able to make my own taco shells and chips at home. You cannot make the tostada shells without making some homemade tortilla chips to serve alongside as a snack. When making your tostadas it is important to season the tortillas with salt as soon as they comes out of the oil. This insures the salt with stick to the warm tortilla. I also made my own homemade refried beans for this recipe. They are so simple to make and taste a-lot better than canned. 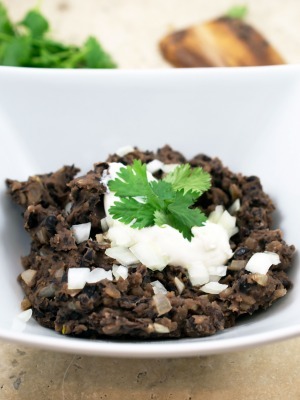 You can always use canned refried beans in a pinch. On top of the refried beans I added my cilantro lime rice. The recipe is simple. 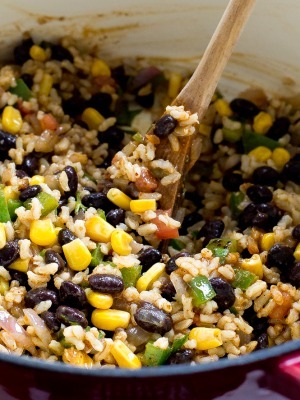 Brown rice, cilantro, lime, and oil make this cilantro-lime rice fantastic. You will end up with extra rice which I serve alongside the tostadas. This avocado cream tastes just like creamy guacamole with a twist. Use the extra as dip for tortilla chips! I love this recipe for entertaining. It makes a wonderful presentation along with chips, salsa, and a pitcher of margaritas. 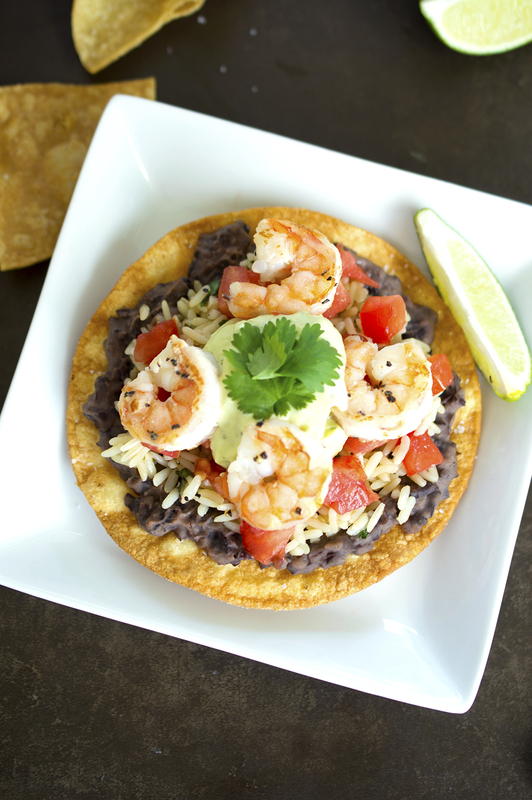 This shrimp tostada goes great with a nice crisp cold beer. Enjoy! Add about an 1-2 inches of canola oil into a large saucepan with high sides. Heat oil to 375 degrees. Cook tortillas for 1 to 2 minutes. Drain on paper towels and sprinkle immediately with salt. Meanwhile, heat a skillet over medium heat with olive oil. Add shrimp and cook until translucent. About 3-4 minutes. Season with salt, pepper and lime juice. Begin by layering refried beans on the fried corn tortilla. Next add 2 tablespoons cilantro-lime rice to each tostada, then sprinkle tomatoes on top. Add cooked shrimp and 1 1/2 tablespoons of avocado cream on each tostada.Garnish with chopped cilantro. Blend all of the ingredients in a food processor. Scrap edges with a rubber spatula and blend some more. Season with salt and pepper to taste. To make the refried beans simply heat a medium skillet with olive oil. Add beans and smash them with the back of a spatula until they are mostly mashed. I like to leave the beans chunky with some beans still intact.Takes about 2-3 minutes. Cook brown rice per packaging instructions. While the rice is cooking, add garlic, lime juice, and oil to a medium bowl. Whisk to combine. Add cilantro and cooked rice to the vinaigrette. Toss to coat. Season with salt and pepper. This looks and sounds delicious! Can’t wait to try it.